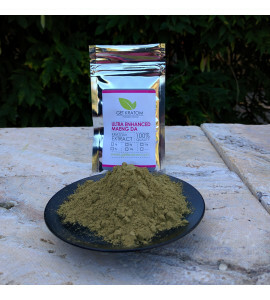 We made our own all natural extract by blending pure alkaloids from Maeng Da kratom with high quality Maeng Da kratom leaf. Unlike some competing enhanced leaves, this is not made with semi-synthetic chemicals but only all natural kratom leaf alkaloidal extract. 2 grams. We made our own all natural extract by blending pure alkaloids from Maeng Da kratom with high quality Maeng Da kratom leaf. Unlike some competing enhanced leaves, this is not made with semi-synthetic chemicals but only all natural kratom leaf alkaloidal extract. 4 grams. We made our own all natural extract by blending pure alkaloids from Maeng Da kratom with high quality Maeng Da kratom leaf. Unlike some competing enhanced leaves, this is not made with semi-synthetic chemicals but only all natural kratom leaf alkaloidal extract. 8 grams. We made our own all natural extract by blending pure alkaloids from Maeng Da kratom with high quality Maeng Da kratom leaf. Unlike some competing enhanced leaves, this is not made with semi-synthetic chemicals but only all natural kratom leaf alkaloidal extract.